The tarantella is named for a peasant woman from southern Italy whose tarantula bite started a contagious dancing fever! 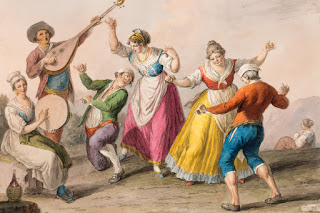 To medieval peasants in southern Italy, the tarantella was more than a catchy tune. It was something powerful and dangerous. 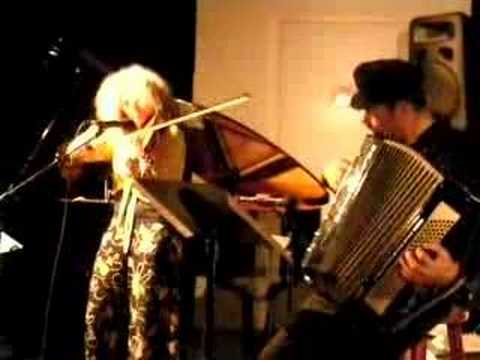 The tarantella could save your life—or drive you to the brink of madness. It was the dead heat of the summer in Apulia. The year was 1431. After a midday nap in the fields, a woman leapt up, crying out that she’d been bitten by a tarantula. The venom began to work in her body, making her dance convulsively. She strutted her way toward the center of town. Soon others joined her, leaping, shrieking, and twirling uncontrollably. They decked themselves out in bright colors and strange ornaments, dancing for days on end and downing vast quantities of wine. The Tarantella was, at once, a rollicking party and a terrifying epidemic. This is how Nicolas Perotti, a witness to these frenzies, described them: “Some victims called for swords and acted like fencers, others for whips and beat each other. Women called for mirrors, sighed and howled while making indecent motions. Some of them had still stranger fancies, liked to be tossed in the air, dug holes in the ground and rolled themselves in the dirt like swine.” It was, at once, a rollicking party and a terrifying epidemic. The dancers believed that the only cure for the tarantula’s bite was to shimmy the venom away. There were even accounts of people who died as a result of not having the right music available. To avoid such disasters, many municipalities employed a corps of musicians to play yearly for the sufferers. The music cure was widely accepted by scholars at the time. Athanasius Kircher, a Jesuit scholar, penned a chapter on tarantism (the dancing affliction supposedly caused by the tarantula bite) that included his prescription for treatment: snippets of sheet music. In some sufferers, the affliction took the form of a terrible melancholy. A woman who had become withdrawn and apathetic after an encounter with a tarantula could be cured with a special ceremony. This was the ritual: In a room hung with ropes, swords, and colorful draperies, she lies on the floor, as still as a corpse. The musicians strike up a tune. They play faster and faster, until finally life begins to return to her. She rolls around on the floor, flails her arms, and then leaps up. As the music stirs her, she begins to dance violently, to tear her clothes, swing from the ropes, even cut herself with the swords. Finally, exhausted, she falls on the floor and goes to sleep. When she wakes up, she remembers almost nothing of her treatment, but is free of her malady. The catharsis of her temporary frenzy leaves her ready to return to the course of normal life. It’s a mystery what exactly caused these epidemics. It was certainly not the “bite” of the tarantula, which does little more than sting. Today, many scholars consider these dancing epidemics to be a response to mental, rather than physical, ailments. In the mass catharsis of the dance, people could express all the ugly feelings—anguish, rage, lust—that were unacceptable in everyday life. For a few days in the summer, people could scream and weep and tear off their clothes, freely and without judgment.